It is a well known, excellent book by Dr. Lara Honos-Webb. The title alone has caused quite a stir amongst people with ADHD for years, even to the point of creating somewhat of a controversy. Today I am delighted to present you with an exclusive interview with Lara. She minces no words as she talks about the “controversy” and discusses how people with ADHD can find their gifts. 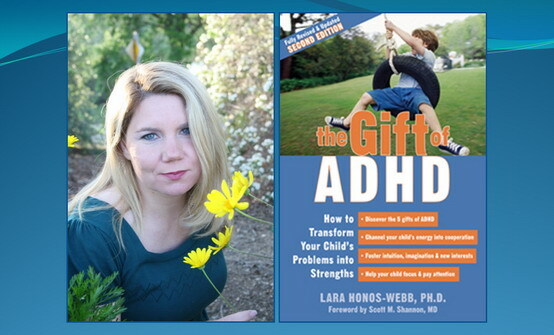 Dr. Lara Honos-Webb is a clinical psychologist and worldwide ADHD expert. She has published several books about the gift of ADHD and has been featured in Newsweek, The Wall Street Journal, The Chicago Tribune and many newspapers across the USA. Q: The term “The Gift of ADHD” has become a very special phrase in the ADHD community, but there are those who are confused as to what it means. What is “The Gift of ADHD”? The “Gift of ADHD” is also used as an intervention; just by finding and focusing on gifts, people change in positive, noticeable ways. They feel better because of improved confidence and motivation. They are not focused on having a disorder that contributes to them feeling like something is wrong with them. They experience real world results – including better grades, higher income for entrepreneurs, better work reviews, and marriages that go from difficult challenges to highly satisfying. Q: Does everyone with ADHD have “The Gift”? There are so many treatable people whose life can be changed by a simple shift in perspective. For example, I work with a client who went from having 6-8 alcoholic drinks a night and severely neglecting his work, to drinking only occasionally. This same client increased his work productivity four times his previous efforts and launched a major creative project in addition to his employment. Using the approach I describe in my book The Gift of Adult ADD, he went from using alcohol to numb his crippling low self-esteem to owning his capacity in sales due to his interpersonal intuition. By recognizing his creativity he launched a successful website that was so fulfilling to him he didn’t spent his time drinking anymore. Because I see results like this consistently, I devote my time, energy and life purpose to helping people move forward so that this kind of pervasive label does not get in the way of them working hard to get good grades, challenging themselves in sports and other activities to focus, and to not see themselves as limited because of a diagnosis. Q: Why do you think there is a controversy about the phrase or concept of “The Gift of ADHD”? I find it very sad and disturbing that there would be controversy about helping children feel more realistic and positive about themselves – their personalities, character traits, behavior and sense of control. 1. Number one reason: Confusion with issue of medication. I write in my books “Whether you choose to take medication or not take medication, you will benefit from finding and focusing on the gifts of ADHD.” These issues are separate, but my work gets misrepresented in the Ritalin Wars. We live in a fast paced, quick fix society and teachers and parents are often over worked and stressed out. The idea of a pill that can calm a child is very appealing. When we stop to take a look at the gifts, it requires us to re-work how we set up classrooms for children, how involved we need to be in children’s everyday lives, how tolerant we have to be of each other in relationships. 2. Number two reason: Sloppy thinking. The controversy results from a failure to differentiate a description and an intervention. I think it’s tragic, but I do get emails from people saying their kids or husbands are so terrible that if I knew them I would never have written so many books or any book on it. Even if the gifts are not an accurate description we know that you get more of what you focus on so focusing and finding gifts creates change. A person who believes there are gifts to ADHD will make real world changes in addition to gaining motivation and confidence. I reliably see kids get better grades from my approach – which includes parent coaching to find and focus on gifts, building emotional intelligence, and advocating for accommodations for the child in school among other interventions. In many cases just reading my books—The Gift of ADHD, The Gift of Adult ADD, The Gift of ADHD Activity Book, and The ADHD Workbook for Teens, – leads to measurable changes. I always enjoy hearing that people feel better and more confident after reading my books, but it’s even better to get emails from around the world from people who after reading my books went from poor students to excellent students or from failing marriages to satisfying marriages and other measurable changes. Another example of sloppy thinking is the failure to realize that two things can be true, that ADHD creates major impairments in functioning AND it is a brain difference that causes breathtaking gifts of wonder. The silliness around this argument irks me. Lets say 5000 people wrote a book to the effect of “Dogs are Brown.” (the parallel is that ADHD is a disorder). Then lets say I wrote 4 books called “Dogs are White”. Then a whole community launched argument after argument about why dogs are brown and documenting all the brown dogs. Let’s say I happened to own a Samoyed so every day I sat there and looked at a white dog and wondered what all the fuss was about. Dogs can be white or brown and I grew up with a white dog with brown spots named Bruno! The case is even more complex because in the case of ADHD a person who believes there are gifts to ADHD will make real world changes in addition to gaining motivation and confidence. 3. A third reason is vested interests. It is widely accepted that if ADHD is a gift, research will not be funded. Some of today’s leading ADHD experts are directly paid by pharmaceutical companies so naturally they have a stake in advocating for medication. 4. The controversy comes in part from the fact that so many people with ADHD struggle mainly because the idea of it being a disorder gets in the way of them moving forward. Many people become shocked by hearing that it is actually a gift. It is true that while some people with ADD have lives that work well, others don’t. My book The Gift of Adult ADD profiles many adults with ADD who have gone on to great success. What makes the difference? 1) Massive action. Believing that you can change your world and brain with hard work creates success. The discovery of neuroplasticity tells us that we can change our brain the harder we try. 2) Define yourself by your gifts rather than your weaknesses. 3) Match. You need to find a job that builds on your strengths rather than patching up weaknesses. You don’t have to be good at everything — you have to be really good at something. Q: People with ADHD are often told that they should use their gifts and their strengths. How does someone discover what they are? 1. If I saw ADHD as a gift, how would I define myself? 2. What are the gifts that my ADHD has given me? 1. What would be too good to be true for me to accomplish? 2. If life just got easier and easier for me what would I be doing? 3. If I won 10 million dollars and then spent one year on a tropical island and then got bored, what would I want to do after that? 4. If I wasn’t afraid of failure, what would I do? Q: How does someone with ADHD go about putting their gifts to practical use? Q: What about improving one’s attitude about ADHD? If you have ADHD, you can change your thoughts around it – every day, every hour and every minute. My clients are often having to cope with side effects and shortages of Adderall, including the addictive qualities and now Dexedrine shortages. There is no shortage of gifts to be found in yourself, or reasons for hope. Q: In what ways can someone with ADHD improve their self-esteem and confidence? • Ask “What Went Right?” I have seen lives changed when people start asking this question. Many people narrowly and obsessively focus on what is wrong. Many people discount positives. You can turn this around by asking every day “What went right?” You can turn your family dinner conversation around with this question. • Think of a time when you felt loved. Spend 1 minute every hour “marinating” in that feeling. It’s too easy to doubt yourself. It’s too easy to remember the slights and the hurts. You can choose to receive love and define yourself by those experiences in which you were cared for and appreciated. • Finding and focusing on gifts you have will create a different future. If what you see isn’t where you want to be, if you change the way you see yourself now, you will change the future. Sometimes you have to believe it first to see it in the future. • Think of 5 past successes. Just thinking of 5 past successes reminds you that you have a track record. Change is hard and goes slowly. Remembering past successes allows you to see how long it can take to make things happen. Also seeing that you have a track record of success allows you to challenge the belief that you just got lucky. You can see you bring a lot to the table and you can bring those same traits and abilities to the table in the current challenge. 1) They have learned from mistakes. 2) They have more credibility. 3) Family responsibilities have lessened so they have less work-family conflict. 4) They have a larger social network. 5) They have testimonials from prior successes. Q: What’s the number 1 way, in your opinion, that people with ADHD hold themselves back? Many people with ADHD know what they are good at and yet choose to try to make a living doing something that comes harder to them. Q: What are the reasons people do what they don’t love? 1. People do things they don’t love, or choose to spend their life with people they don’t love because they are trying to make other people happy – many times, their parents. 2. People do things they don’t love because they think the rewards are worth it – money, prestige, or fame – take your pick. 3. People do things they don’t love because they never took the time to think about what they love to do or are good at. 4. People do things they don’t love because someone told them that life is SUPPOSED TO BE HARD. 5. People do things they don’t love because they were afraid to risk themselves in what they really wanted. It makes us more vulnerable to put our real selves in our work. It hurts a lot more if we fail than if we are just punching a time card. 6. People do things they don’t love because they don’t know how to do what they love. 7. People do things they don’t love because they have limiting beliefs about what is possible or acceptable. Ask Yourself: Why am I not doing what I love? Q: What’s the most frequent question parents of children with ADHD ask you? “Can my child be successful?” To this question I refer them to my book The Gift of Adult ADD which profiles 10 very successful adults who attribute their success to the gifts of ADHD. Q: What’s the funniest question you’ve ever been asked? Q: Do you have any projects or books coming soon? 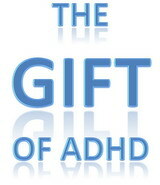 I have launched an on-line self-directed coaching program based on the Gift of ADHD at www.addisagift.com. I am an expert contributor to the website www.Sharecare.com, founded by Dr. Mehmet Oz in partnership with Harpo Studies and Sony Pictures, to improve health and wellness. My current books The Gift of ADHD 2nd edition, The Gift of Adult ADD, The Gift of ADHD Activity Book and The ADHD Workbook for Teens continue to reach people across the globe and change lives. For more tips and tools about ADHD visit my ADD is a Gift site and www.visionarysoul.com as well as stay connected with me at The Gift of ADHD facebook page. Thank you, Lara! I had fun with this interview and enjoyed the answers as I am sure my readers do. Readers: What was your favorite question and answer? Tell us in the comments. If you are interested in Dr. Lara Honos-Webb’s books, Click Here to check them out!